I have gone a little bit AHA crazy recently. After the Liquid Gold success story, I wanted to try out some other exfoliants and see how they compared. (For those of you didn’t follow my little summer skincare saga, have a look at my ‘skincare miracles‘ post for a brief catch-up.) Chemical exfoliants are now definitely my beauty ‘gold’ – they seem to have an instant clarifying and brightening effect on my skin and longer-term, they appear to be keeping it plumped-up and blemish-free. Last week I stopped using chemical exfoliants completely (by chemical I mean as oppose to mechanical scrub-type products, not necessarily that the exfoliants aren’t ‘natural’) and I instantly got four spots – two on my cheek, one at the side of my nose and one next to my lip! Now knock me down with a feather if that’s a mere coincidence? 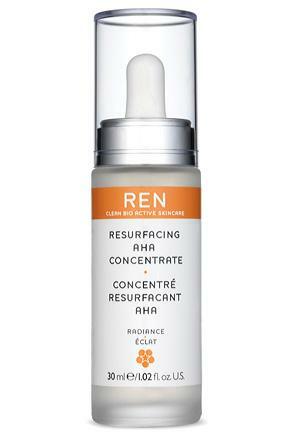 The latest product on my testing list is REN’s Resurfacing AHA Concentrate. I used it for a good few weeks with no side-effects or strange, bubonic reactions. It’s an overnight serum that contains a complex of glycolic, tartaric, lactic and citric acids to promote cell-turnover and exfoliate away dead skin cells on the skin’s surface. It smells fruity-ish, quite pleasant, really, but beneath the surface there’s a whiff of something business-like and functional. Which is always reassuring when you’re after results rather than a nice-smelling sugar-pill product. I’m not entirely sure how effective the various acids are in the serum as I have no details on what quantities they are present in and at what pH they work at and so on. If I dug out my A Level chemistry books I could probably have a stab at doing a little bit of research, pH-wise, but quite frankly I’m time-poor this week and more importantly, I wouldn’t have a clue what I was doing. Overall, I’d say that my skin is most definitely bright and clear in the morning after using REN’s Resurfacing AHA Concentrate, but it doesn’t feel as though it’s had quite as much of a ‘workout’ as I get with the Liquid Gold. I think that this is probably a much milder product – it certainly feels that way, and I have been using it without any problem for nine nights in a row, which wouldn’t be at all advisable with a low pH glycolic exfoliant. This could be a nice choice if you want to ‘dip your toes’ into the overnight exfoliant world – it’s a fruity, friendly introduction, and though I’m not utterly convinced that it’s performing at the same level as some other resurfacers (more reviews soon) it’s a gentle way to ease yourself in. The fact that it can be used nightly makes it easy for those who need to stick to the same routine day-in day-out, but I’d say, from my testing so far, that the results are gradual and subtle. There’s also a mask in the same range which has a beautiful brightening effect – the Glycolactic Radiance Mask. It has the same acid cocktail inside the bottle, but this one gets rinsed off after ten minutes – I’m assuming that the ingredients are more potent, but again, I couldn’t tell you for sure! 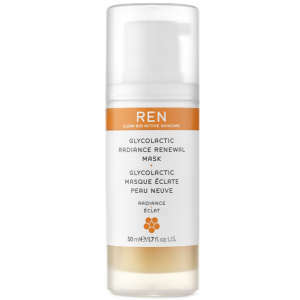 I really, really rate REN products and I’m pleased that they’ve introduced this range – it’s a bit more ‘active’ than the other products, so those looking to step up from a gentle routine have something to dabble with. The serum is £30 and the mask is also £30 – I’d definitely recommend these over the scrub. Though the scrub smells gorgeous and leaves skin soft, in general I’m just more inclined towards non-abrasive exfoliants these days! Both products can be found at LookFantastic.com – I’ve linked through to the right page!